Patella Femoral Syndrome is a common knee injury among athletes and active people. Also known as Patella Femoral Pain Syndrome and Patella Femoral Compression Syndrome, it is characterized by pain around the kneecap that increases with activities. Understanding the symptoms of Patella Femoral Syndrome, what causes this condition, and ways to help prevent it can significantly help to keep you off the sidelines. Patella femoral pain syndrome is an inflammation of the patella femoral joint - the area where your kneecap meets the thigh bone. It can be a very complex condition, often with numerous contributing factors. Boiled down to the basics, it centers around the patella, and the way that it tracks within the femoral groove. To understand this, we first must understand the anatomy of the patella femoral joint. 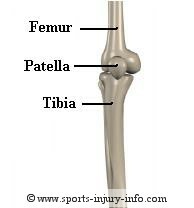 The patella is a small bone that sits on the end of the femur. The femur has a shallow groove in which the patella moves up and down during knee flexion and extension (bending and straightening). The quadriceps muscles are the large muscles on the front of your upper leg, and all four connect to the patella, and then the patellar tendon connects them to the lower leg. When you contract your quadriceps, the patella moves along the femoral groove. With patella femoral compression syndrome, the patella is not quite centered within the groove. This can be due to several factors, which we will discuss in a minute. As the quads contract, the patella moves along the groove, but if it is not aligned correctly, there are areas of greater pressure, and areas of lesser pressure. Repetitive activities often cause irritation of the patella and surrounding structures, because of these abnormal pressures. As irritation increases, you begin to have pain around the kneecap, and eventually have a continual ache throughout the knee with all activities. There are a lot of different sports injuries that involve the knee. Ligament ruptures, bursitis, tendonopathy, and patella femoral syndrome name just a few. So how do you recognize whether your knee pain is caused from PFS? The most common complaint with patella femoral syndrome is pain, located on the sides of the kneecap. You may also have discomfort under the patella. 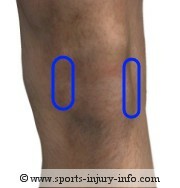 Pain may be localized to a pinpoint spot, or it can be diffuse throughout the front of the knee. There may be a grinding feeling, or occasional popping of the knee as well. Swelling is not very common with patella femoral syndrome, however, it can occur. When it does, the knee will look "puffy" and may feel tight. Running, sprinting, jumping, going up and down stairs, and squatting are all things that can increase patella femoral pain. As the condition worsens, it is also common to have pain with prolonged sitting, especially when the knee is kept in a bent position. Most sports involve running and jumping, so you can easily see how this can cause your knee to hurt. Rest will usually make your knee feel better, however, without fixing the underlying problems causing the malalignment of the patella, your pain is going to return once you start playing again. And if it is a severe case, simple things like walking and standing can cause pain as well. What Causes Patella Femoral Syndrome? There are many different causes of patella femoral syndrome, and it is difficult to pinpoint a single cause in every person. Most people who suffer from patella femoral syndrome have several contributing factors. I group these contributing factors into four primary groups. I'll give a brief summary of each of these factors. Structural mal-alignments focus on the way your body is built. Every person is a bit different. Think of your body's skeleton and muscles as a very complex machine, made up of lots of levers and "pulley" systems. Muscles attach to bones, and when they contract, they cause movement. The alignment, or direction of pull of the muscles on the bones, determines how your body moves, and how efficient you are with your movements. Because of this, alignment within these systems is very important. Two examples of structural alignments include a shallow femoral groove, or a small patella. Both of these factors can contribute to patella femoral syndrome, yet there is very little that can be done to change the depth of the groove or the size of the patella without surgery. Other structural and alignment factors that can contribute to patella compression and anterior knee pain include foot mechanics. It has been suggested that over-pronation may contribute to these problems. The foot is our first point of contact with the ground when you walk, run, or jump. The structural alignment of the foot determines how much stress is transferred up the leg, as well as the direction of this stress. Pronation and supination at the foot can often contribute to problems at the knee and hip, and patella femoral syndrome is no exception. If you over pronate at the foot, you may suffer from patella femoral syndrome. The good news is that by changing other factors, like mobility and muscle activation, structural issues can often be overcome. Mobility and flexibility determine how much motion is available in joints throughout the body. Flexibility is a term I use when talking about the relative tightness of muscles, while mobility relates to motions at the joints. 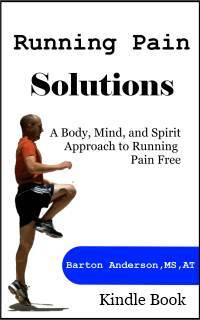 We have all had days where we felt a little stiff, like we just couldn't move normally. Or realized that some of our muscles feel really tight. These mobility restrictions are very common in almost everyone, and small restrictions in many different joints will add up to big problems when it comes to patella femoral syndrome. Poor hamstring flexibility has long been considered a major factor in patella femoral syndrome. The hamstrings are the large muscles on the back of the upper leg. When they are tight, they place an increased amount of stress on the knee, hips, and lower back. This increased stress forces the quadriceps to work harder, and can alter the way the patella rides in its groove. More recently, the relationship of other surrounding muscles, including muscles at the hip, have also been attributed to patella femoral syndrome. Poor flexibility changes the normal alignment of our musculoskeletal system, and is a significant factor in the cause of patella femoral syndrome. Mobility is different from flexibility, in that it involves the joints, rather than muscles, causing the restrictions. Mobility in patella femoral compression syndrome is often focused on how much the patella moves, and in what direction. While this is important, what we often fail to realize is that it isn't the mobility of the patella that is the problem, but rather mobility of the joints above and below the knee that contribute to patella femoral syndrome. Mobility restrictions at the hips and lumbar spine, especially hip rotation, are now being looked at as a major contributing factor to anterior knee pain. Mobility restrictions cause a lot of problems when they are present. The most significant of these is movement compensations. Mobility restrictions cause a loss of motion at a joint. Most of the time, this is measured in just a few degrees, and you probably won't even know that you are missing joint range of motion. When one joint loses motion, the body will compensate for that loss by gaining extra motion at another joint - the movement compensation. Using the hip as an example, if you are missing just a few degrees of hip extension, your body will compensate by creating more lumbar extension, or more hip rotation, in order to try to maintain the best alignment and to perform your everyday activities. These movement compensations change the normal way the body works, and over time, they increase the stress on tissues, like the patella femoral joint. If you have patella femoral syndrome, you have probably heard that you have weakness - most likely of the vastus medialis oblique muscle - the VMO. Weakness has long been, and continues to be, the number one contributing factor the medical profession points to for the cause of patella femoral syndrome. This probably makes sense, and is exactly what you have been told - you need to have stronger quads to help control the patella. While quadriceps and VMO strength are important, they may not be as important as the strength of the surrounding muscles. More recently, studies have started looking at a variety of strength factors related to patella femoral syndrome. And the findings are now shifting away from the VMO and quads, and to the hip muscles. Imagine the patella as a train, and the femur as the track. Everyone knows that a train will run safely as long as it has a stable track. The number one cause of train wrecks is a problem with the track. The same is true for the patella. Recent studies have pointed toward biomechanical problems associated with patella femoral syndrome as coming from weakness at the hips. Hip weakness creates an inability to adequately control movements of the femur during activities. Instead of maintaining normal, good alignment, the femur collapses in towards the midline of the body. When the femur collapses in, it cause the femoral groove to shift and rotate under the patella, resulting in over stress of the PF joint. This will also result in a "lateral riding" patella, a common factor that is given for patella femoral syndrome. Strengthening of the hip muscles helps to control this motion, providing a more stable femur during activity. As long as your femur (the track) is stable, then your patella will work efficiently and safely. If the muscles controlling your femur are weak and cannot keep it stable, your patella is bound to wreck, causing all kinds of problems. The final contributing factor that plays a role in patella femoral syndrome is fundamental movement patterns. These patterns do not operate separately, but rather are influenced by all of the other factors that we have talked about. Mobility, flexibility, muscle strength and activation, and even structural alignment, contribute to normal movement patterns. There are some fundamental patterns that we tend to lose as we get older and less active, and some that we lose because we are active. Movement patterns center around the brains ability to coordinate the right muscles to contract at the right times, and play a role in keeping the body and joints stable. How do you treat PFS? Because patella femoral syndrome is a very complex condition, with many possible contributing factors, it is important that you seek medical attention from your health care provider. Rest will help reduce your pain and discomfort, but will not address the underlying problem. Your athletic trainer should be able to pinpoint specific things that are causing your pain, and then design a rehab program to address these problems. A good rehab program should consist of flexibility and mobility exercises, strengthening exercises, especially for the hips and core, and balancing exercises. I offer a comprehensive treatment program in Patella Femoral Solutions. 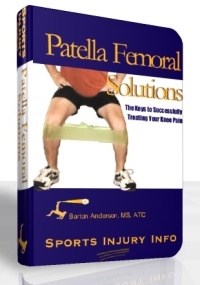 It is a set of exercises proven to eliminate knee pain caused by patella femoral syndrome. In this program I address each of the above factors, and provide exercises that will help to improve your mobility, flexibility, strength and muscle activation, and your overall movement patterns. These exercises are, unfortunately, often overlooked by most traditional therapy programs, and until newer research on the importance of mobility, hip strength, and movement patterns reaches clinicians, will continue to be overlooked. The use of a knee brace or orthotics may be necessary depending on the structural alignments present. Rest and ice are the first steps in treating your patella femoral syndrome. Ice will help to reduce inflammation in your knee, and to reduce pain. Rest from aggravating activities reduces the stress on the area and allows for recovery. But remember, you must fix the underlying problem in order to recover completely. You should see your physician for an evaluation and recommendations. And then a comprehensive strengthening program for your hips, core, and quads, along with mobility and flexibility exercises is the key to treating this condition effectively. Patella femoral syndrome is a complex and common knee injury. It is best treated with guidance from a certified athletic trainer or physical therapist, who understands the complexity of the injury and the proper ways of addressing the many different causes. Proper warm up and stretching, as well as a conditioning program focused on hip and core strength can help you prevent this condition. If conservative rehabilitation fails, surgical options include a lateral release. Souza RB, Powers CM. Differences in hip kinematics, muscle strength, and muscle activation between subjects with and without patellofemoral pain. Journal of Orthopaedic & Sports Physical Therapy. 2009;39:12-19. Ireland ML, Willson JD, Ballantyne BT, Davis IM. Hip strength in females with and without patellofemoral pain. Journal of Orthopaedic & Sports Physical Therapy. 2003;33:671-6. Powers CM. The influence of altered lower-extremity kinematics on patellofemoral joint dysfunction: a theoretical perspective. [Review] [49 refs]. Journal of Orthopaedic & Sports Physical Therapy. 2003;33:639-46.